Based on the original concept of the NSI Superstrapz, the Proton utilizes a cam buckle adjustment system. The cam system offers fast and easy customized range of adjustment, without the hassle of standard velcro adjustable straps. 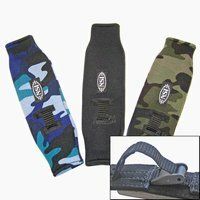 The combination of heavy duty webbing and a neoprene cover creates a strong and durable strap with a soft and cushy feel. Super lightweight performance. Sold individually. Two Shred Tech strap control washers included.